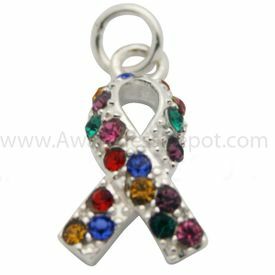 Beautiful Autism Awareness sterling silver and Swarovski crystal ribbon charm! This is such an adorable charm, with beautiful Swarovski crystals. Pictures really don't do it justice- the crystals sparkle wonderfully. Made of .925 Sterling Silver and genuine Swarovski crystals. Genuine Sterling silver with Swarovski crystals. Measures 3/4 inch by 1/4 inch tall.